Hello Guys today I will tell you guys about MVC, what is it and how would it help programmers in smooth programming. It is the architectural pattern which is used in all the latest programming languages to develop scalable projects. Each Model, View, Controller handles specific development aspect of an application. It is the representation of information or data that you want to display to user. Model have classes (If you have heard or used Object oriented programming you might have heard about Class). Classes define different parts of your website. For example, if you have a e-commerce website, there are various different aspects like customer, products, categories, orders. Classes will be created for each of this section of your website. Customer class will have all the properties of customer like first name, last name, address, contact info. An order class will have all properties of an order such as the date it was created and the customer who placed the order. Product class will have all properties of product. Model gets all these data from database and data can be read, updated and deleted. Partial View is one of the benefits. Partial view helps you call a specific section of the page without reloading the entire page. It contains all the logic of your website. Controller also has class with the all methods and logics. It acts as the interface between the Model and View. Whatever you want to do in your website all the code is written here. For example, if a user wants to see their profile, view will send the request to controller, in controller the code to read the profile will execute and send a request to model. 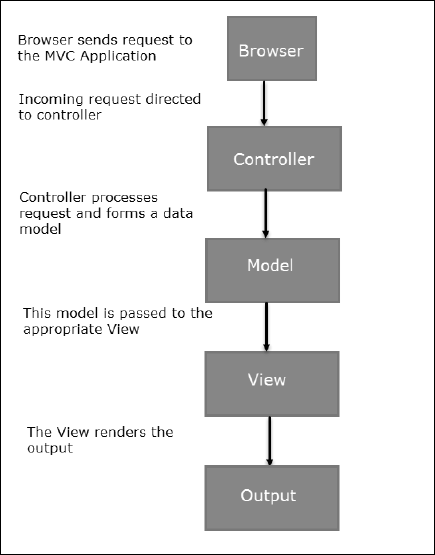 After this model will return the requested data by controller and the controller will display the data via view to the user. But you have to see that the name of the controller, view and model should be same, because the name acts as a reference to one another. For instance, the “Home” controller is automatically linked to the “Home” view. MVC platform are secure and systematic. Most of the programming languages use this platform. But some CMS of PHP like WordPress, Joomla are not built-in MVC platform. In PHP if you don’t use MVC you end up coding the same code repeatedly as the PHP code is aligned with HTML. If you use MVC you can use the same code multiple times. Just point the view to the model you want to use. In MVC it is easy to track bugs and fix them. Updating code is also easy, code can be easily understood by any programmer if he/she has the understanding of MVC. It is very handy for large-scale projects. Code mismatching hardly occurs, has person working in either of Model, view or controller is working separately. Nothing is perfect and yes MVC has cons. Building MVC means dealing with large number of files. Sometimes for a single webpage you might need 3-5 files. If you don’t keep proper track, MVC projects can get out of hand pretty quickly. If the programmer is not familiar, he might face problems in tracking the code properly. Complex file structure means your website performance might get affected. Yes, MVC is a great platform to build your next web application, but if the programmer is not familiar with the platform, things might get difficult. Said that MVC is the best platform which will help you build agile and robust websites. And from now on you should only built your website in a MVC supported platform.